Musical Director Stephen Razo has had an extensive and varied career in the music field. He is a former award winning high school instrumental music director, an accomplished former Air Force military band commander, a published composer/arranger, and currently conducts the prestigious Moreno Valley Wind Symphony. Mr. Razo began his professional career as a high school music education instructor in the Oxnard Unified School District in Ventura County, CA and in the Glendale School District, Phoenix, AZ. where he directed award winning high school programs between 1975 and 1982. In 1982, he was chosen, through national audition by Col. Arnold Gabriel, then commander of the Air Force Band, Washington D.C., to enter the Air Force band program as a commander. As an Air Force military band commander, he was the Deputy Band Commander at the Air Force Academy, Band Commander of the Air University Band, Montgomery, Al, and the commander of the Band of the Air Force Reserve in Warner Robins, GA. While under his command, the Air University Band and the Band of the Air Force Reserve received the Air Force Outstanding Unit Award. He transitioned into Air Force Public Affairs full time and became public affairs director for the 452 Air Mobility Wing at March AFB in 1991 and then became the host public affairs spokesman for March Air Reserve Base from 1996-99. Mr. Razo is currently Director of External Affairs for the Bureau of Land Management, California Desert District, located in Moreno Valley, Ca. 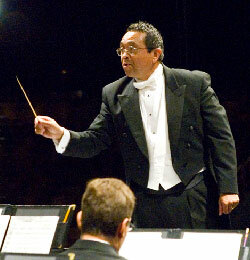 He began conducting the Moreno Valley Wind Symphony in 1998. The wind symphony has enjoyed phenomenal growth in the last few years as the ensemble enters another year of musical excellence under the direction of Mr. Stephen Razo.